The Unheard Story of David and Goliath by Malcolm Gladwell has 1,987,433 views on YouTube and 5,305,649 views on the TED website. His book, David and Goliath: Underdogs, Misfits, and the Art of Battling Giants, spent time on both the New York Times and USA Today bestseller lists. The projectile Gladwell estimates is going about 35 meters per seconds or 78 miles per hour. The stones of this valley are barium sulfate which are stones twice the density of normal stones or rocks. The stopping power of this stone from David’s sling is estimated to be the same as that of a .45 caliber weapon. The accuracy of an experienced slinger could hit a bird in flight and could maim or kill at distances up to 200 yards. He begins his litany of physical evidence that paints Goliath as the underdog by saying, “Here is David, this shepherd experienced in the use of a devastating weapon up against this lumbering giant weighed down by a hundred pounds of armor and heavy weapons which are only useful in short range combat. Goliath is a sitting duck, he doesn’t have a chance. So why do we keep calling David an underdog and why do we keep referring to his victory as improbable?” Gladwell believes we profoundly misunderstand and overestimate Goliath; that Goliath is not what he seems to be; and that the biblical text gives us information which when examined does not square with our image of Goliath. Gladwell goes on to wonder whether or not there is something physically wrong with Goliath, as a 1960 Indiana medical journal speculated, and he says that this article led to many more articles of similar speculation — the first had to do with the height of Goliath and of a possible cause. Gladwell states that the reason Goliath stands head and shoulders above his peers is due to a form of gigantism, most probably acromegaly: a tumor on the pituitary gland that causes an overproduction of human growth hormone. Some of the side effects of acromegaly are enlarged hands and feet, fatigue and muscle weakness, impaired vision, headaches, pain and limited joint mobility — but vision, according to Gladwell, being the principle one. As the tumor grows it compresses the visual nerves. This results in double vision or profound near-sightedness. He says that this speculation has led to the conclusion that Goliath looks and sounds like he has acromegaly and that this would explain much about that day: why he moves so slowly, why he has to be escorted down to the valley floor by an attendant, and why he is so strangely oblivious to David? David and Goliath has been used by pastors as evidence that our God is the God who defeats giants and that nothing; no circumstance or situation, is too big for our God. But does Gladwell’s version agree? Hardly. Instead, the tale Gladwell offers up makes God underwhelming, unexceptional, and unneeded; here is why. Gladwell’s claims about the biblical story differ substantially from biblical texts. For example, Gladwell attributes to the Bible the notion that Goliath was “led onto the valley floor by an attendant,” but where does he find this in the biblical text? The Bible says in 1 Samuel 17:41, “And the Philistine moved forward and came near to David, with his shield-bearer in front of him.” None of the most popular or scholarly versions reads, “led onto the valley floor by an attendant.” Even if ‘led’ is the appropriate word, it would merely imply that the attendant ‘went before’ or ‘walked in front of’ rather then ‘led’ as though by the hand. Nothing in the text suggests that Goliath was weak or could not see well enough to walk for himself, as Malcolm speculates. Further, Gladwell tells us to “make special note of how slowly Goliath moves,” yet again this is not anywhere in the text. 1 Samuel 17:41 says “the Philistine moved forward . . .” Nothing in the passage in any of the most popular or scholarly versions of the Bible provides any information about the supposed Goliath’s slowness. Malcolm Gladwell seems to be using the ERV (Easy-to-Read Version) of the Bible though he doesn’t mention this in the video. Gladwell says, “Notice how long it takes Goliath to react to the sight of David,” and then he asks why Goliath does not react to the fact that David doesn’t have a sword and shield, saying, “it’s as if he is oblivious to what is going on that day.” Evidence for this claim too is found nowhere in the text. Quoting Goliath, “Come to me that I might feed your flesh to the birds of the heavens and the beasts of the field,” Gladwell believes the phrase implies Goliath’s vulnerability and supposes the phrase to mean: “Come to me because I can’t see you.” If Goliath could not see more than a few feet in front of him, is it reasonable to think that an army would stake its entire victory on such a vulnerable warrior? Gladwell again quotes Goliath, “Am I a dog that you should come to me with sticks?” Gladwell states incredulously, “Sticks!? David only has one stick,” as evidence for Goliaths supposed double vision caused by his acromegaly. The more reasoned explanation for Goliath’s comment would be that the giant warrior, Goliath, was mocking David; not double vision. Verse 42 of 1 Samuel 17 provides ample evidence for this view (no pun intended), “And when the Philistine looked and saw David, he disdained him, for he was but a youth, ruddy and handsome in appearance.” This not only suggests that Goliath was mocking David, but also and contrary to what Gladwell would have us believe, there was nothing at all wrong with Goliath’s eyesight. If Goliath’s acromegaly caused him to see double or have extreme nearsightedness, how would Goliath know David was young, ruddy, and handsome in appearance? 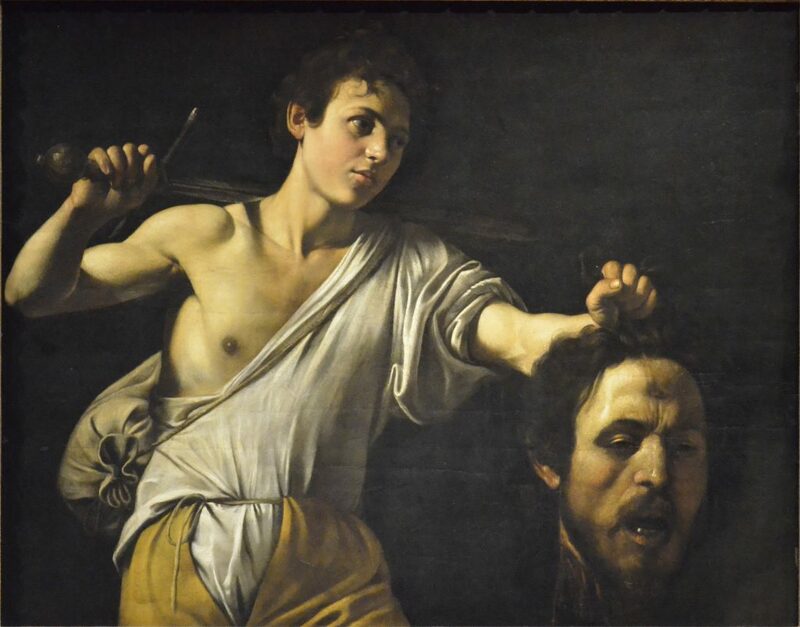 The more likely case is that Goliath thought David’s choice of weapon was as ‘sticks’ or child’s play — nothing of merit or concern. If the claim is that Goliath had to be led onto the field of battle because of his frail condition, then how could he be expected to fight wearing 270 pounds of armor and carrying 37 pounds worth of weaponry? Why would the Philistines place their hope of the victory in the hands of a giant who would be more for show than for combat? Gladwell states that Christians and non-Christians the world over believe or have been taught that David is the underdog; Gladwell pushes back at this idea and on this point, I agree with him. Nowhere in the Bible does it say David believed he was the underdog. In verse 32 David says to Saul, “Let no man’s heart fail because of him; your servant will go and fight with this Philistine.” But Saul believes David to be the underdog in the next verse, “You are not able to go against this Philistine to fight with him; for you are a youth, and he a man of war from his youth,” and tries to put armor on David; Goliath too believes David is the underdog when he mocks David’s choice of weapon and says of David, “Come to me, and I will give your flesh to the birds of the air and the beasts of the field!” This is a problem with church tradition: we ascribe a false narrative, which is passed down as truth; if anything, as we read the text, it was David who considered Goliath to be an underdog to the God of the Israelites. While I do take issue with Gladwell’s account of the ‘real’ story, a far deeper and more troublesome concern is that there are more than a few pastors who have bought into Gladwell’s conclusion that “. . . sometimes the shepherd boy has a sling in his pocket,” and the natural belief which follows from it: that one’s natural abilities are a reasonable substitute for the faith that one places in God. Gladwell’s argument is as follows: it was David’s skill and his accuracy as an experienced slinger — that he could hit a bird in flight and could maim or killed at distances up to 200 yards — which won the day; it was the sling which hurled the stone; it was the stones of this valley made up of barium sulfate which are twice the density of normal stones or rocks and had the stopping power of a .45 caliber weapon; it was Goliath’s expectation that he would be fighting another heavy infantry soldier and not a slinger like David; it was David alone who fought a not-so-fearsome and even weak giant — blind and slow; in the end many pastors and teachers seem to agree that, as Gladwell concluded, “Giants are not as strong and powerful as they seem . . .” This teaching will subtly but almost inevitably lead to the belief that we defeat giants based on what we bring to the battle, and because the giants are disabled and weak, we are fighting the battle ourselves with weapons of our own invention — no God required. P: God can be trusted to defeat the giant in our life. P: Goliath was feeble, was nearsighted or had double vision, brought the wrong weapons, and was confused. P: David used his powerful sling and dense stones to kill Goliath. C: We defeat our giants with tools of our own making. If this is the conclusion we reach, we need to ask, do we even need God to help us defeat this version of Goliath — a version where Goliath is feeble, half blind, needing help to fight, and was confused; indeed, God is not needed if the credit goes to David’s skill with his sling or to the density of the rocks. Ignored by Gladwell and others is that the Philistines place the fate of their nation in the hands and skill of Goliath; ignored is the fact that none of the Israelite soldiers noticed or speculated about the handicaps of Goliath; and ignored is the fact that Goliath struck fear into the heart of Israel’s greatest warrior king — King Saul. There are at least two problems with what Gladwell and many pastors are teaching (maybe without realizing it): if giants are small, then they can no longer be called giants; and if giants are feeble, handicapped, and confused, there is no need for us to turn to God for help when simple self-confidence will suffice; self-reliance is the serpent’s lie. It is the first lie told, believed, and acted upon — that we will be like God, and if we are the slayers of giants and God is not required, it follows that our faith and trust for deliverance and help ought to be placed in ourselves rather than God. Gladwell’s view suggests that the outcome of the battle is based upon circumstance: David’s skill with a sling, the kinds of stones he used, Goliath’s physical disabilities, etc. His belief implies that David’s faith in God was not only misplaced but it was completely unnecessary. Notice how this view contradicts what we read in 1 Samuel 17 and how David placed his faith and expectation in God as protector and deliverer of Israel. David appeals to the faithfulness of God and to what God had done for him in the past; because of this, David could expect that God would give Goliath into his hand and that God would deliver Israel. Like David, our expectation, our faith, and our hope should not be in our weapons, our gifting, or our skill but in God because it is God alone who defeats and delivers us from the giants in our life. NOTE: Malcolm Gladwell’s TED Talk is for his book, David and Goliath: Underdogs, Misfits, and the Art of Battling Giants, and is about battling the giants in our lives — that the weak can defeat the strong. However flawed his theory may be it should not be considered a sermon or even doctrinal in nature. I have no wish to portray it in such a manner, but to examine his evidence and how it is affecting the church today.